Gordon Sears was born May 26, 1922, and died July 31, 2001, at age 79. He was a pastor, evangelist, and musician who worked with some of the well-known names in gospel music of the past generation, including Rudy Atwood. Though I had many opportunities to correspond with Brother Sears, I only met him one time, and that was soon before he died. I had been preaching in Wisconsin, Minnesota, and northern Michigan for two weeks in July 2001, and though I was in a hurry to get home and it was somewhat out of my way, I felt impressed of the Lord that I must stop by and meet Brother Sears. That was July 26, and he died on the 31st. I thoroughly enjoyed the visit. Though very ill, he was in good spirit and was enthusiastic. He had long subscribed to O Timothy magazine and had wanted to meet me. He told me about his days on the road in full time ministry and expressed his consternation at the rapid decline of the spiritual character of fundamental Baptist churches over the previous two decades. Beginning in 1973, Brother Sears traveled full time for fifteen years with his family, singing and conducting evangelistic meetings across the States and Canada and up in Alaska. His daughter plays French horn, three of his sons play trumpet, and the fourth son plays tuba. They had a brass quintet as well as a trumpet trio, and many hearts were encouraged and blessed by their godly music. I remember hearing them at Highland Park Baptist Church in Chattanooga, Tennessee, during the mid-1970s when I was at Bible School. I was saved at age 23 and attended Bible college a year later, in 1974. In those days, the music at Highland Park was truly sacred and it was thrilling to hear the voices of that huge congregation lifted up in sacred song under the enthusiastic direction of Dr. J.R. Falkner. Every number by a choir or solo or group was of the highest spiritual standard, and nothing about the music reminded one of the world that I had been saved out of. There were no worldly background tapes produced by unregenerate Nashville musicians. Christian rock was unheard of among fundamentalists. It was just beginning to get the tiniest toehold in some circles out in California. In those days, the Sears family fit right in at churches like Highland Park, and music of that standard was the rule rather than the exception among independent Baptists. Things have changed rapidly during the past 25 years. And since Brother Sears’ desire was to maintain the highest spiritual standard in Christian music, he was deeply disturbed by the great decline in such standards among fundamental Baptist churches. Through the school of hard knocks, he learned that fewer and fewer churches would book a meeting with a musician and evangelist who refused to use music with a sensual beat and who was not willing to keep quiet about that issue. Eventually he was forced to stop traveling. “When I traveled across America with my family in evangelism during the 70’s and 80’s, we were invited to participate in some Bible Conferences. We held to Christ-honoring music, and also spoke out against CCM, which was spreading into churches at that time. It was not long before we realized we were placed in a compromising situation and our convictions on the subject of music were not compatible to those of the conferences. From that point on we did not accept their invitations. By 1988, it was getting to the point where speaking out against CCM was not the popular thing to do, even in some of the independent Baptist churches. “Not only are conference speakers forced into a corner where they dare not speak on the subject of CCM, but if they choose to write books and expose CCM in their writings, people will soon retaliate by not buying their books and not attending their meetings. They become the ‘bad guys.’ This puts them in a position where they must either compromise or take a firm stand for Bible separation. Most take the posture of compromise. It’s like the old adage: ‘If you can’t lick ‘em, join ‘em. “In my letter to him, I offered some thoughts on CCM and expressed my belief that this worldly music is the cause of strong division within local churches and a great hindrance to the work of the Holy Spirit. I asked him why he and others did not speak out against this evil that invites the sensual sound and emulation of the world into the churches. I eagerly anticipated his answer—but it never came. He has never answered my letter. To be perfectly candid, I understand why this brother did not respond to my inquiry—because I’m sure he, like so many others, realizes that this subject is like a bomb that could blow up in his face. “Time and time again I have talked with pastors who tell me they do not approve of CCM, but even so, they permit it to be used in their churches. We held one of our Songfests in a church in Florida in 1992, when Rudy Atwood was still with us. On several occasions after we had presented our music, the pastor remarked, ‘Now that’s my kind of music!’ But whenever his choir or soloists sang, they used CCM with taped background for all their music. “A few years ago I was in one of our four-day family conferences near Baltimore, Maryland. The pastor said he enjoyed our music and the emphasis on the home. He told me he wanted me to come back once every year and speak on the family. The next year I went back, and during the message I spoke out about CCM. That brought an abrupt conclusion to any further meetings at that church. So I do have first-hand experience with what happens when anyone dares to speak out against CCM. Attitudes will change very quickly!” (Gordon Sears, Apostasy and Deception, pp. 70, 71, 74, 75). When many doors were closed to him by the early 1990s, he found himself in a financial quagmire. He didn’t have enough meetings to justify continuing full-time on the road; his travel trailer was mortgaged and he had other debts; he did not own a house or property; and he had very little monthly support. IT WAS AT THAT POINT OF EXTREMITY THAT HIS GOD SHOWED HIMSELF FAITHFUL and Brother Sears was given a lovely farm house on acreage in southern Michigan. There, in that quiet rural setting, he lived out the last years of a productive life with his dear wife and daughter under the same roof and two of his sons living nearby with their families. In spite of declining age and serious physical ailments (i.e., heart and kidney disease, dialysis treatments), Brother Sears was not content merely to sit in a rocking chair and reminisce of days gone by. He continued to travel some part time. In fact, his final meeting was about one and one-half years before he died. He learned to use a computer and started writing. He continued to publish music through his Songfest ministry. He used the marvelous tool of e-mail to communicate with a wide range of people (including the author of this brief biography) far and wide. 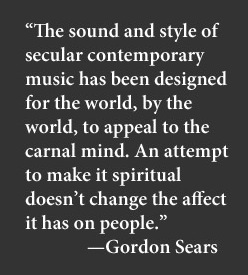 This simple but profound statement goes to the heart of the Christian music issue. In 1998 he published the 104-page Apostasy and Deception in Christian Music. It was a hard-hitting book that went straight to the heart of the problem: carnality in the pew and compromise in the pulpit. Chapter 6 was titled “Preparing for the Storm” and the author warned that “signs of an impending storm are clearly seen on the horizon. It is time to take a stand and strengthen our homes and churches for more Satanic evils that may lie ahead.” Chapter 5 contains the testimonies of preachers and music directors on why and how they have kept Contemporary Christian Music out of their churches. Writing in 2013, I can say that the storm that Gordon Sears foresaw in 1998 is here. Many independent Baptist churches, such as Trinity Baptist Church in Jacksonville, Florida, have become full-blown rock & roll institutions and those who still use sacred music and who say they are opposed to CCM are strangely quiet about what is happening. Influential leaders such as Paul Chappell and Ron Hamilton and professors at Bob Jones University and Pensacola Christian College and Northland Christian College are justifying the use of contemporary worship music and are trying to blacklist those who resist the tide and who simply stand where these very men and institutions stood only 15 years ago. When he died on July 31, 2001, Brother Sears had almost completed another book, entitled The Rapid Decay in Sacred Music. It lacked only the final chapter, and his daughter prepared it for publication. It was completed in October 2002. The following quotes from Brother Sears’ writings reveal the deep concern he had for the spiritual condition of Bible-believing churches. I believe he had a prophetic insight into these matters and that his voice needs to be heard far and wide. May the Lord raise up another generation of plain-spoken preachers to sound the trumpet warning against compromise. We had a delightful visit at our home yesterday (Saturday) with David Cloud from Way of Life Literature. Although we have had considerable contact with Bro. Cloud through the Internet, we had never met him personally, so this was a very special occasion. Music of Bro. Cloud's ministry is in the area of exposing the end-time apostasy. There are very few today who dare to take the stand upon the Word of God and speak with authority as this man does. I was raised in the days when preachers didn't beat around the bush about sin. So many today speak in generalities, but fail to mention what sin is and what the sins are. They may mention about Bible separation from the world, but fail to point out what those separations are. Few ever teach the evils of Contemporary Christian Music, that would be offensive because they know many of their people are listening to this music in their homes. They may speak about Christian standards, but they fail to deal with the manner of casual, sensual dress styles because too many of their church members dress like the world. They will not deal with the subject of Bible perversions because their members carry these bibles and have not been taught that this also is part of the apostasy. They will not expose "false teachers" and therefore, many in their congregations do not know the difference between those who teach the truth and those who are wolves in sheep’s clothing. It's a sad day when preachers are afraid of offending someone, so they appease the people by not mentioning what the sins are and not exposing who false teachers are. It is indeed a tragedy that preaching with power and authority is nearly non-existent during these perilous times. No doubt I will upset some with what I have said above, but I would point out that the Scripture says to the preacher, "Preach the word; be instant (persistent) in season, out of season, reprove, rebuke, exhort with all longsuffering and doctrine" (2 Tim. 4:2). This is what we need today. Physical problems continue to hinder me from completing my new book titled THE RAPID DECAY IN SACRED MUSIC. Along with kidney dialysis, which takes three days of the week, I now have an infection that has been painful and weakening. Bro. Cloud encouraged me to finish the last chapter of the book and with your prayers I hope to accomplish this soon. May God help us all to, "Watch ye, stand fast in the truth, quit you (conduct yourselves) like men, be strong" (1 Cor. 16:13). P.S. by Ruth Ann Sears: Dad went to be with his Heavenly Father an hour or so after writing this letter...this IS his final chapter! AMEN.